Roehampton's inaugural 20/20 overseas cricket tour started in fairly indifferent style. Following the numerous emails and general begging for players we had mustered 10 and agreed with La Manga that they would supply a couple more to make a squad of 12. Many had thought us brave for attempting such a task, after all we don't as a club even play 20/20 cricket, while others agreed that the shorter form of the game may be more appropriate given our average age and very average cricketing abilities. Before even departing we'd been reduced further to 8, with captain Hilson on crutches from an injury playing ladies hockey and Dharmesh having been refused a visa by Spanish authorities (for any number of valid reasons). So the eight of us met at Gatwick Airport, with our 10kg of hand luggage and 2 shared kit bags. Practice began promptly at 8am that Thursday with the first round of pints and before we knew it we were on the plane and on our way to sunny Spain. By the time we landed we'd suddenly noticed that Spain wasn't quite so sunny, but that made the drive in our 2 luxury hire cars that much easier (Mods and Freeborn given the nominated driver responsibilities). Only one wrong turn taken (courtesy of Phil's lack of direction - already looking for the shade to avoid burning and his usual sunstroke) and within an hour we had taken a whip and sent Nick Lyell to order the drinks at the appropriately named Scotsman. Cash points visited, provisions secured and finally we were ready to check into our villas and prepare ourselves for our first night on tour. Mods briefly had to visit another airport as Darcy had made the ultimate sacrifice, leaving his wife to pack all their house in preparation for their return to Australia, while he took a late flight to sunny Spain for 2 nights. We were now up to 9 and headed to the Flute bar before we suddenly noticed the size of the task ahead (both individually and of the squad size we would encounter). The Royal Engineers had brought 18 and Liam decided to immediately start flirting with the most petite, who also happened to be wearing a dress. The beer flowed, a captains meeting was held, Sacha and Mods attended and returned to the troops looking horrified (or was it bored) and a team decision was finally taken to get some food. Tapas was the obvious call, so imagine our surprise when the Tapas restaurant turned out to be an Italian. Some pizzas, Peroni and Rioja (spot the odd one out) later and having scattered as many beer coasters around the establishment as possible we stumbled out, quite literally in the case of Freeborn, at about midnight and headed back to our villas for a few beers while watching the Masters. Tournament day one (Friday) began with a mad scramble for anything warm. Our captain had not only failed to turn up, or get eleven of us, he had also failed to order the team shirts. Luckily I've been re-assured that the squad will receive them as soon as his credit card bill looks healthier. Most of us had failed to bring a jumper and those that had them were rubbing their hands in glee. In fact everyone was rubbing their hands, arms feet and anything else because it was freezing. Game one began with Sacha losing the toss to Litchfield. 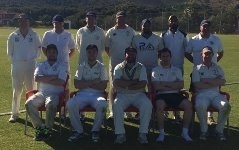 Luckily La Manga had come up trumps and supplied us 3 players (Hugh, Bittu and Sukhi) who joined our merry but cold squad. Put into bat we scored a colossal 203. Given the proximity of any shelter from the elements and the scoring facilities, we had failed to notice Nick Freeborn making his century (although graciously he didn't hold it against us or remind us at all) this may also have been due to our pre-occupation with Nick Lyell getting in a terrible grump at being placed at 12 on the batting line up. The game also allowed Mods and Darcy to rekindle an old Uni batting partnership and judging by their speed (or lack of it) between the wickets, it must have been a wonder to witness them in their youth. Apparently they have some black and white footage somewhere, Bradman may be on the same cinematic reel too. At tea (and we were all drinking it from the refreshment hut) we had no takers to be 12th man. This more than anything demonstrates just how frozen we were. Darcy sat out the first 10 overs until Sacha in an inspired move, subbed himself out and made Phil captain on the pitch. Sukhi, Lylo, Hugh and KD all bowled well with little joy mainly down to the supporting cast putting 8 catches down, and so it all came down to the final over. Needing 30 to win, Liam was given the Ben Stokes role and promptly got smashed for 6 first ball. By luck, Litchfield had been out till 5am and failed to capitalise on the other 5 half volleys served up and suddenly we were one from one. Surely it would all be downhill from here. The weather got even worse as the rain in Spain fell mainly on - all of us - while we watched other teams but relented in our second game of the day against Waltham and Rosedale. Sacha lost the toss again, and this time RCC were asked to bowl. Despite another fielding display where more catches were dropped than taken, only 127 runs had been scored, while all the bowlers had excellent figures. In reply Freeborn and Cogan both scored 50's in an unbeaten opening partnership that had the game won in 15 overs. The sun was now shining and the squad tucked into as many local beer brands as the refreshment hut could serve up, before undertaking yet another whip and returning to the villas for BBQ night in the knowledge that no matter what happened in our last group game, we were now unexpectedly in the semi-finals. Saturday morning started with the dawning realisation that a) we couldn't find somewhere to have breakfast and b) the outside pool was ice cold. No one wanted to start thinking about our game against the Spanish national side too early. When we turned up at the ground, once again dressed in our mix and match whites, we were once again reminded of just how underprepared we were. Every other team had matching coloured clothing and kit, and today's international opponents were in full red. We watched their warm up closely while seeing if we could psych them out by doing no warm up at all. We had lost Bittu and Sukhi but had gained Stuart to add to our antipodean credentials. Sacha lost the toss again and Spain decided to bat. RCC started well with the ball with both Lylo and KD bamboozling the Spanish openers with variations in pace. Darcy pulled his hamstring in the first over and with no 12th man available, unfortunately the acceleration came through the middle and end of the innings with some lusty blows out of the ground. Spain had reached 199 by the close and many around the ground were eagerly anticipating an international upset. The chase began well with the third consecutive 50 run opening partnership between Nick and Corey, but fizzled out quickly, not helped by a further injury to Phil Dorsett while warming up. The refreshment hut had never seen so many requests for ice without an order for beer. By the end of the 20 overs RCC had come up well short and were already refocusing their efforts on an early ground departure, quick shower and trip to the nearest bars and restaurants. After finally finding a tapas restaurant that sold tapas, Mods took Darcy to the airport to head home and pack. We were back to 8 but determined to show the other larger, more capable and considerably more suitably attired squads what it was to be a member of RCC. So to an Irish bar called Mulligans we went. A few gentle beers watching the football, a couple of games of pool, a discussion about which one of Liam or Corey had the brain cell and then it happened. The Jagerbombs arrived and the world seemed different. Suddenly numerous rounds of shots were being purchased for whomever scored the least with a single dart. Before we knew it the Karaoke kit was being set up and we were going to take the lead. Bar staff were advised that we had a number of X-factor contestants within our midst, although I think they may have reconsidered following the murdering of numerous 80's ballads. Of particular note to the wider community was the subtlety of the singing from the Australian quartet of Liam, Corey, Kieran and Mods during their cover of one ACDC hit. Warnings over standing on barrels took place and before we knew it the entire party had moved to us. We were the trend setters, the in-crowd, everyone wanted to be a part of RCC. Bushy once again found his Royal Engineer friend in a dress appealing and refused to leave with the rest of us when we finally decided that enough was enough. Sunday morning was hard. Nobody wanted to wake up. When we did, we realised that we were already late for our semi-final against Sutton Coldfield. A number of our players were struggling with liquids, and one had turned into a ghost. Just for a change Sacha lost the toss and RCC were asked to bowl which was exactly what everyone wanted to do after an egg and bacon roll. The fielding was neither better nor worse than before, we had found our consistent level, although this time we were provided less catches to drop. The bowlers struggled through their blurred vision and at the end of 20 overs we were chasing just over 200. We didn't get close, making little over half the required amount and decided to forfeit the 3rd/4th playoff game to facilitate an immediate return to our villas to get some well needed sleep. We awoke a few hours later and returned to the ground to join all of the other teams in supporting Sutton Coldfield beat Spain in the final. A formal dinner at the Spa took place that night for all the players in the tournament and the prize giving saw Nick Freeborn win (and then misplace) the batsman of the tournament award. Nick Lyell won a prize in the raffle and immediately focussed his gaze on the available bottle of Limoncello. He had obviously made an impression on our opposition and they clearly knew that he was our club welfare officer by the way they honoured him in song. A night of finishing off any remaining alcohol while watching Jordan Speith throw the Masters away was followed by a 6am alarm call for an early morning departure back to London where we all went our separate ways having agreed that we should definitely return next year and do it all again. Liam "Bushy" Symonds Farewell, Poker & Pizza Night Saturday the 23rd of April 7pm  Bushy's heading back to Oz!! !